While each field service organization has its own workflows and customer requirements, there are several well-documented best practices that can be widely adapted and applied. Technology use isn't enough to propel organizations to best practice status, and in fact has become a requirement to efficiently execute basic tasks to remain competitive in many field service segments. 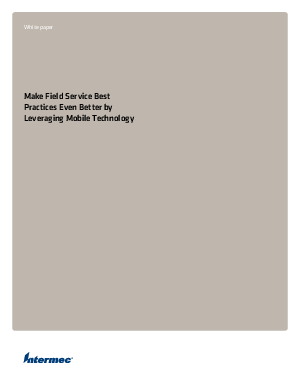 As mobile computing and communication technology has become more sophisticated, less expensive and more accessible, it has become harder for field service organizations to maintain a competitive advantage through these tools. This white paper identifies best practices for workforce optimization, resource management, revenue assurance and performance control, explains how technology supports these processes, provides leveraging current mobile and wireless technology to enhance processes to improve productivity and profitability.